Hornbaker's Small Engine Repair & Welding is your Commercial Fleet Maintenance company in Chambersburg! Our experience mechanics can help maintain your company's fleet vehicles to keep them in their best operating condition. We can also take the hassle of maintaining maintenance and service records for your whole fleet off your hands so you can focus on getting to your next appointmet or call! We want to be able to work with your already busy schedule, so we offer our customers flexible hours to meet any company needs. Please call us at 717.261.9560 for a FREE consultation to see how Hornbaker's Repair & Welding can help make managing your commercial fleet easier! 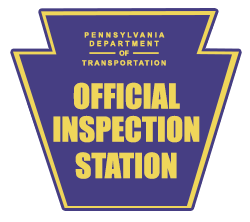 Keep your commercial fleet vehicles up-to-date with our PA State Inspection service. We can help keep your fleet vehicles on the road for service calls and appointments by keeping the State Inspection updated.